Caravan, an expanding eatery with new roots near Seoul’s Dosan Park, seems to have mastered the art of all-day dining. At its latest outpost, which opened mid-December in Sinsa-dong, diners can tuck into breakfast, lunch, dinner, dessert and bar snacks in an airy space with high ceilings, floor-length windows and powder blue and buttery orange-brown seating. It is the kind of spot that one could settle down into with a book and a seamless stream of eats from morning to night, be it a 3 p.m. lunch, a 5 p.m. dinner or a midday dessert. “We call ourselves an eating house and coffee bar,” said Caravan owner-executive chef Adam Kane, 37, who first opened a shop in Hapjeong-dong nearly a year ago before opening a second location near Dosan Park. Kane, who grew up in Australia, wanted to transplant the eating and cafe culture he experienced in there to Seoul, creating a space where people could meander in when feeling peckish, whenever that may be, and sit down and sip on multiple cups of coffee and nibble on a variety of eats. “We have Asian food, European food and Middle Eastern food,” said Kane. A glance at the extensive menu does indeed unveil a wide range of options, from a hummus and falafel wrap to risotto to Thai curry. 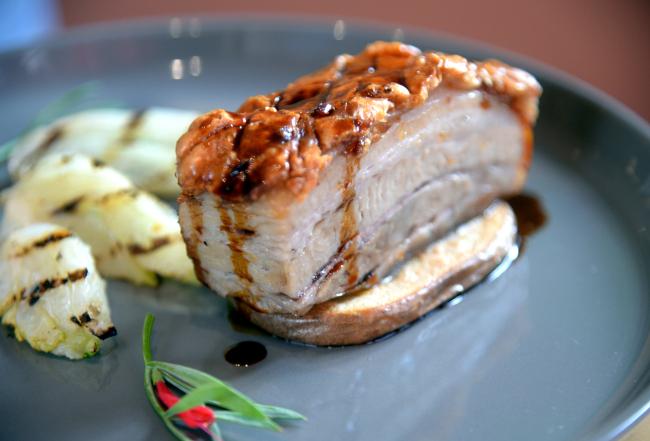 What Kane and his team do so well, however, is not only providing diners with plenty of variety, but with solid variety that also transitions smoothly throughout the day. The quinoa porridge, currently available only at the Dosan Park outpost, is one such eat. There is the nutty, slight fluff of the quinoa itself, intensified by the housemade almond milk it is served in and the honeyed nut crumble all over the top. Seasonal fruit, like fresh strawberries and blueberries, add a pop of slightly tart sweetness while a dollop of coconut cream-infused yogurt in the center adds a rich, addictive tang to this filling breakfast dish. There are lunch-friendly and dinner-friendly eats like a risotto amplified by rich chicken broth, mushrooms, sage, butter and Pecorino and a fried chicken burger, where the chicken breast has been rendered juicy and tender with a buttermilk-based marinade before getting batter-fried, doused with some fiery peri-peri aioli and sandwiched between an eggy, olive oil-based housemade brioche bun. Then there are the baked goods. There is an ever-changing line-up of sumptuous cakes, including a Victoria sponge, a delicate and aromatic chai tea chiffon cake and a treat beloved in both Britain and Australia -- banoffee pie. A fairly straightforward Victoria sponge, Caravan’s strawberry layer cake is served up as a generous slice large enough for two, towering with fresh, cool cream, two layers of thick, dense and slightly crumbly cake sandwiched around a cream, strawberry and jam filling. 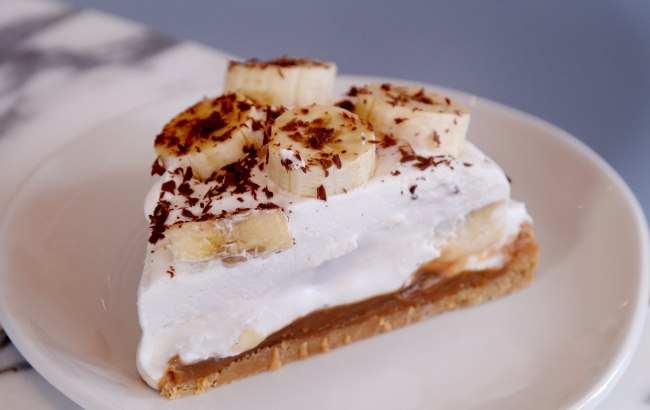 Then there is their banoffee pie, done up in traditional fashion, with a pressed biscuit crust, a gooey, sweet and rich housemade condensed milk toffee layer and heaps of cool cream, slices of banana and shaved chocolate. There are also fragrant, winter-friendly treats like their German-style ginger cookies, small morsels coated in a sweet icing -- fluffy and spiced on the inside, perfect with a cup of tea or coffee. Bread, of course, is not to be neglected, and it is the sourdough, which also serves as the base for many of the dishes served at Caravan, that shines in that department. The toothsome combination of a burnished, crackly crust with a smoky finish and a creamy, tangy and custardy center is achieved with a double proofing that lasts 24-hours and a stone deck oven. “The slower the fermentation the more flavor,” Kane explained why he favors a second and longer proofing for the sourdough. 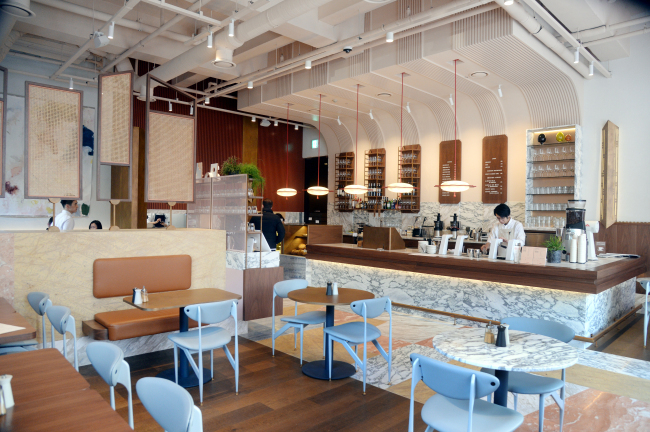 Given the strength of their baked goods, it is not surprising to hear that plans are to open a third location in Hannam-dong this February that will be devoted to bread and cakes. Kane said the third spot will also be serving some light eats as well.